When the Russian director Sergei Eisenstein saw Disney's "Snow White and the Seven Dwarfs," he called it the greatest film ever made. High praise from a man whose "Battleship Potemkin" then topped lists of great films. In "Snow White" (1937), Eisenstein saw a new cinematic freedom: Cartoons could represent any visual an artist could imagine. They were no longer shorts for kids, but worthy to stand beside realistic feature films. In 1940, Disney made its second and third cartoon features, "Fantasia" and "Pinocchio," and they are generally considered to this day to be the best of all the studio's animated films. Perhaps they're so good because they came at just the right time in the development of animation. The early pioneers (Walt Disney and Max Fleischer in particular) found ways to make their characters something more than just drawings on a screen--to make them seem to exist in a world of gravity and dimension. They experimented endlessly with how an animated character should move, finding a new kind of stylized realism that carried conviction without mirroring the real world. The animation expert Ernest Rister writes: "I wonder if they knew that finding a technique for investing a drawing with a sense of weight and volume would someday be used to create killer bugs or a giant snake in the Amazon." After the breakthrough of "Snow White," the Disney animators went back to their storyboards with a couple of innovations up their sleeves. One was the freedom to imply that there was space outside the screen. In "regular" movies, characters were half-seen at the edges, they entered and exited, and the camera panned and zoomed through additional space. Early animation tended to stay within the frame. In "Fantasia" and especially "Pinocchio," Disney broke out of the frame, for example in the exciting sequence where Pinocchio and his father are expelled by the whale's sneeze, then drawn back again, then expelled again. There is the palpable sense of Monstro the Whale, offscreen to the right. Another innovation was the "multiplane camera," a Disney invention that allowed drawings in three dimensions; the camera seemed to pass through foreground drawings on its way deeper into the frame. There is an aerial shot of Pinocchio's village in which the camera zooms past levels of drawings, until it arrives at a closeup. This was much better than using only simple perspective to show depth. These innovations were not much noticed by "Pinocchio's" audiences: They were drawn in by the power of the narrative. The story of the little puppet and his quest to become a real boy is a triumph of storytelling with a moral. Has popular culture ever produced a more unforgettable parable about the dangers of telling a lie? The story is just plain wonderful. It contains elements that would be refined into the Disney formula (Figaro the cat and Cleo the goldfish would be recycled into countless comic relief sidekicks), but its main story line is designed with almost diabolical cunning to reach children. The key is Pinocchio's desire to become a "real little boy," not just a wooden puppet that can walk and talk without strings. At a very deep level, all children want to become real and doubt they can. 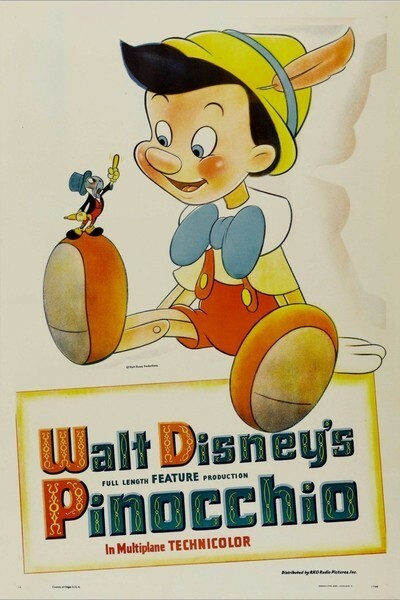 One of the film's inspirations is to leave Pinocchio more or less on his own in the process of becoming. He's supplied with a father figure in Geppetto, the kindly puppetmaker, but the old man is forgetful and easily distracted. And he has Jiminy Cricket, who applies for the job of being Pinocchio's conscience, and gets it, without being terribly well qualified. What Geppetto, the Blue Fairy and Jiminy do is provide a vision for Pinocchio--an idea of what he should strive toward. But the Blue Fairy warns him she will only help so much, and the other two aren't much help at all. Kids know they should be good, and know they are weak when tempted. Pinocchio stands for all of them as he sets off for school and allows himself to be diverted by Foulfellow and Gideon. This twist comes as a surprise: The movie has opened on a gentle, mellow tone, with "When You Wish Upon a Star" and Geppetto's bedtime play with the puppet and friendship with Figaro and Cleo. The Blue Fairy's magical visit is enchanting. Jiminy is a cheerful new friend. And then suddenly Pinocchio is blind-sided by the two con men who supply him to Stromboli, the vile puppeteer. He finds himself starring as a puppet song-and-dance man ("I've Got No Strings"). Jiminy, who is not a gifted analyst, shrugs and figures that since Pinocchio is a star, he doesn't need him anymore ("What does an actor want with a conscience, anyway?"). Why doesn't Jiminy know how worried Geppetto will be? Maybe crickets don't understand human love. Pinocchio tries to escape, is locked in a cage by Stromboli, is visited by the Blue Fairy, and then (in one of the best movie scenes ever filmed) tells her lies and finds that his nose grows and grows and grows. Finally it sprouts leaves and gains a nest with two chirping birds in it. Glance sideways at children during this scene, and you'll see kids utterly fascinated by the confirmation of their guiltiest fears. The Blue Fairy grants a reprieve, but Pinocchio lands back in the soup, scooped up by Foulfellow and shanghaied to Pleasure Island, where little boys smoke, play pool, and are recycled into mules for the salt mines ("Give a bad boy enough room and he'll soon make a jackass of himself"). Through the poisons of tobacco and their sins, they grow ears, hooves and snouts; how many kids decided right then and there never to smoke? Pinocchio and Jiminy escape and return at last to Geppetto's, only to find (in a powerful and gloomy scene) that the old man is gone. Pinocchio feels abandoned, and in the audience the eyes of kids grow large and moist. The Blue Fairy, deus ex machina to the last, sends a dove with the information that Geppetto is captive in the belly of Monstro the Whale. That leads into the last great action sequence, where Pinocchio proves himself at last. The climax is a cascade of visual imagination. Everyone remembers Monstro's thrashings after Pinocchio sets a fire to make him sneeze. But the action is preceded by a long and magical sequence in which the puppet and the cricket wander the ocean floor, encountering fish, sea flowers, coral denizens and other delicately drawn creatures. Once we've grown up and learned, or ignored, the lessons of the film, why does it continue to have such appeal? It may be because of the grace of the drawing. Later Disney films would have comparable skill, but not the excitement of discovery. Is it possible to sense, through thousands of individual drawings by dozens of different artists, a collective creative epiphany? I think so. Disney's loyal animators had been there in the early days when Mickey Mouse cartoons were patronized by Hollywood as kid stuff from a dinky side-street shop. They must have known they were making something great. Their joy saturates the screen. What the Disney shop did with its first animated features has resonated through film history. Ernest Rister says in a letter: "I cannot tell you how many of today's computer graphics artists have the book Disney Animation: The Illusion of Life at their work stations." All modern animated content in movies, from Jabba the Hut to "Toy Story," springs from those years of invention at Disney, he says: "The same principles apply everywhere, and those principles were all discovered under one roof, decades ago by a bunch of young punks jazzed up about creating something."